The Lincoln Stars scored a goal in each period in Cedar Rapids to beat the Roughriders, 3-2. The win broke a three game winless streak for the Stars. Scoring for the Stars was Eric Alexander, Chris Forfar (PP), and Kirt Hill (GW). Kirt Hill was the only Stars player with multiple points (1 goal, 1 assist). Lincoln goaltender Anthony Borelli saved 28 of 30 shots on goal in the win. The Stars outshot the Roughriders, 34-30 (yeah!). Quality, quality road win against a very good hockey team. I didn't get to watch or listen to this game, so I'm just going off of what I've heard from other fans and the stats available on Poinstreak. I'm very happy to see the Stars powerplay clicking, and I was shocked to see Cedar Rapids only had four powerplay opportunities. The big three of Kretzer-Hill-Alexander had a terrific game, and Coach McGroarty said afterwards that it was probably Alexander's best game as a Lincoln Star. With Hill healthy again, it's important those three keep producing scoring opportunities. 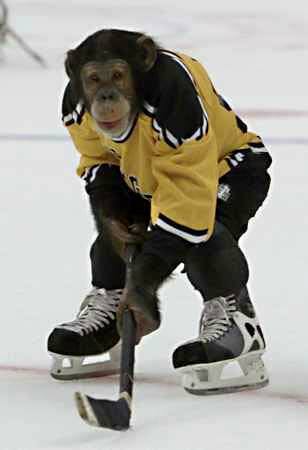 Looks like the hockey monkey mojo worked for this game. Very happy for that. I'll have to break him out in the future when the Stars have a critical game coming up. No rest for the wicked as the Stars travel to Counciltucky on Tuesday night to battle the Omaha Lancers. I had to stop by the Ice Box this afternoon, and was surprised to see the team practicing. Talk about a brutal stretch of hockey. Road games in Indiana, Chicago, and Cedar Rapids three straight nights...and practice Monday afternoon. I'm sure the team got in early Monday morning, and practiced that same afternoon. Wow. Big game coming up Tuesday night against the Lancers, so I'm sure the coaches wanted to go over some things on the ice before the game. I'll get a pregame report up during the day tomorrow sometime.